Last Sunday Charley and I took a walk together. We love to walk around holding hands, but this was a bit different. 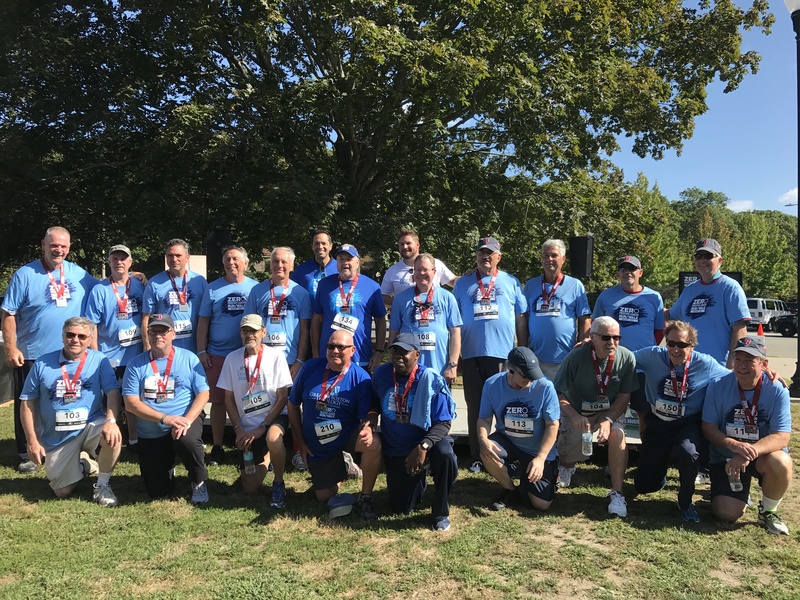 It was a 5K walk/run fundraiser for the group that is helping Charley in his quest to end cancer – to find a cure for this disease – ZERO-The End of Prostate Cancer. 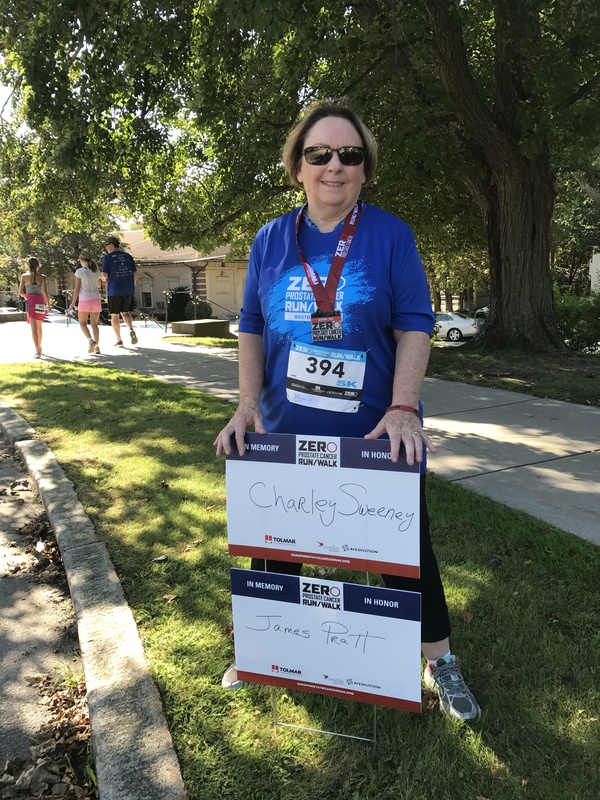 I walked in memory of my dad, James Pratt, and in honor of my husband, Charles Sweeney. Zero is the number men want to see when they get their PSA (Prostate-Specific Antigen) blood test results back from a screening or physical. Charley’s PSA at one point elevated to 178 – not a good sign. He’d already had his prostate removed and had undergone 36 radiation sessions, but his PSA kept rising, signaling the cancer had spread. He was told he was going to die. We decided that was not an option for us. Forty-five years ago, my dad was diagnosed with prostate cancer. He was cared for at home, thanks to my mom, who learned to administer shots for pain and to my sister, a student nurse at the time. Having no medical proficiency, I was only good for hand-holding and late night conversations. He died in June of 1977. He suffered terribly. I was firmly resolved that this time there would be a different ending. What followed was a decision to become actively involved in clinical studies at Johns Hopkins Hospital in Maryland. It meant committing ourselves to regular trips to Baltimore. It entailed, for Charley, constant scans, blood tests, x-rays, drug trials, and two operations with long months of rehab. 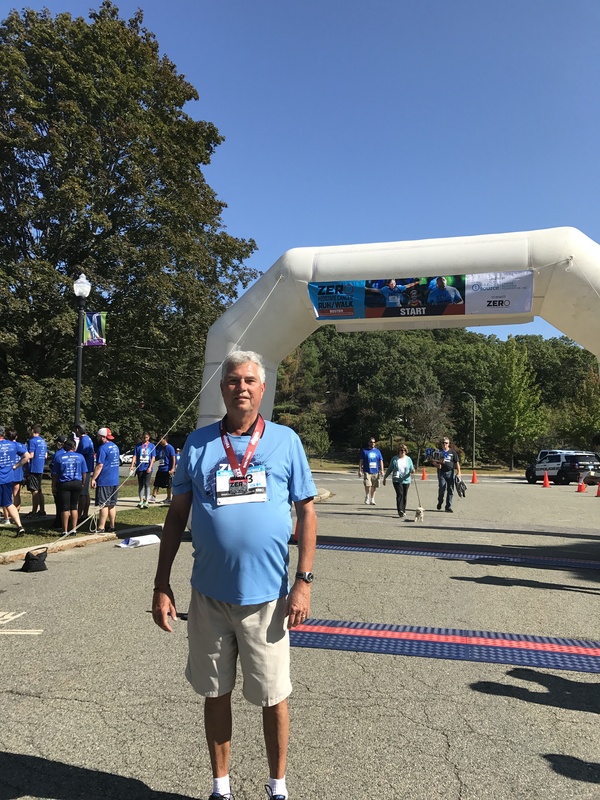 Charley – Crossing the finish line. Still a lot of work left to do! It continues to this day. Ten years later, Charley is still alive and well and his PSA is now at Zero. He’s in remission. We haven’t found the cure yet, but it’s going to be soon if the government does not cut research funding. This is crucial, not just to men with prostate cancer, but to women with breast cancer and children with leukemia and so many others with colon cancer and brain cancer and skin cancer…the list goes on. When a cure for this cancer is found, others will follow. If the funding is cut, studies like the one Charley is now in, studies that have placed him into remission, will eventually cease. Only 1% of men with prostate cancer are involved in clinical trials. These trials are time-consuming, they are expensive, and they are crucial in the search for a cure. For years, we absorbed the cost and along with the time commitment, it was difficult. When Charley began receiving Medicare, it was a big help. But the drug costs are off the charts. Pharmaceutical companies have placed the cost of many drugs out of the reach for most people. And not all of the drugs in clinical studies are covered. The study he is now in involves two drugs – Zytega/Abiraterone ($5,000 a month and not covered) and Xtandi/Enzalutamide ($7,450 a month) In one arm of the study, men are given only the Xtandi. Men in the other arm of the study take both drugs together. Charley was placed in the latter. That’s $12,450 a month on medicine alone. He’s been in remission for three years. It’s a five-year study and the results will have an enormous impact on the path of treatment for men with this disease. The Provenge Treatment he received prior to this study is priced at $93,000. Staying alive and healthy can be a costly business. We wouldn’t be able to continue in the study if organizations like Zero were not there to help us financially and emotionally. They are an amazing group of men and their care givers. We’ll be attending their annual symposium in Washington this February and personally lobbying Congress to ensure that funding continues so we can reach that finish line and find the cure. In March, I published a post about our first Zero Symposium. I had promised his surgeon/doctor that if he put him into the best clinical studies, Charley would be the first man ever cured of advanced prostate cancer. That was over eight years ago, after he was told he would not be alive to see his grandchildren born. Today, he’s picking up his 5-year-old grandson Henry after school. They’re going bowling and then having dinner. He’ll probably read to him from one of the many books Henry loves to share with Grampa. Charley spent Wednesdays in July, with his oldest grandson, 6-year-old Daxton. Dax took a golf lesson and then they played nine holes and had lunch and talked about all things golf. And he spent Thursday mornings in August taking 4-year-old Hadley to toy-testing sessions at Hasbro, a local toy company. He’s even been a Grampa toy tester for them. And this month, he’s taking all thee of his grandchildren to the toy store to pick out their birthday gifts. It’s an annual fall tradition. A tradition he would not be enjoying if we didn’t have Medicare; if we didn’t have access to the treatment at Johns Hopkins; if we didn’t have the financial support of Zero; if we didn’t have access to healthcare. And everyone should be afforded these same benefits. Health care is a right and anyone who doesn’t understand that needs to experience what we’ve been through, first hand, without those benefits. Minds would soon change. There is no dollar value to place on the days we’ve had together and on the time Charley has been given to do all of the things he loves. The value of the lives of others suffering from this disease is incalculable. We’ve been fortunate in the help we’ve received and we want to share our good fortune. Zero’s Heroes – the survivors! Charley is in the back row, third from the right. Charley once had a conversation with a family member. He confided in her that he owed his life to me and she “knowingly” informed him that it was actually the drugs to which he owed his life. This clueless, young woman couldn’t have been farther away from the truth in her assessment of what keeps people alive and well. Although the medicine is critical, it’s the continued support of other people that gets patients and their advocates through the hardest of times. And so, on Saturday night, Charley and I slept at our good friends Jack and Jean’s home near to Boston, where the race was scheduled. On Sunday morning, they had coffee and breakfast ready for us. They’ve been there with us through it all and we are truly thankful for their love, their loyalty and their many acts of kindness. Then we set out to take our walk together along with 500 other survivors, family members, caregivers, advocates, medical professionals, sponsors. Kindred spirits dedicated to an important cause. We didn’t run. We just strolled along. We weren’t interested in winning any prizes. We walked and talked and held hands. We already had been given our prize – another day together. 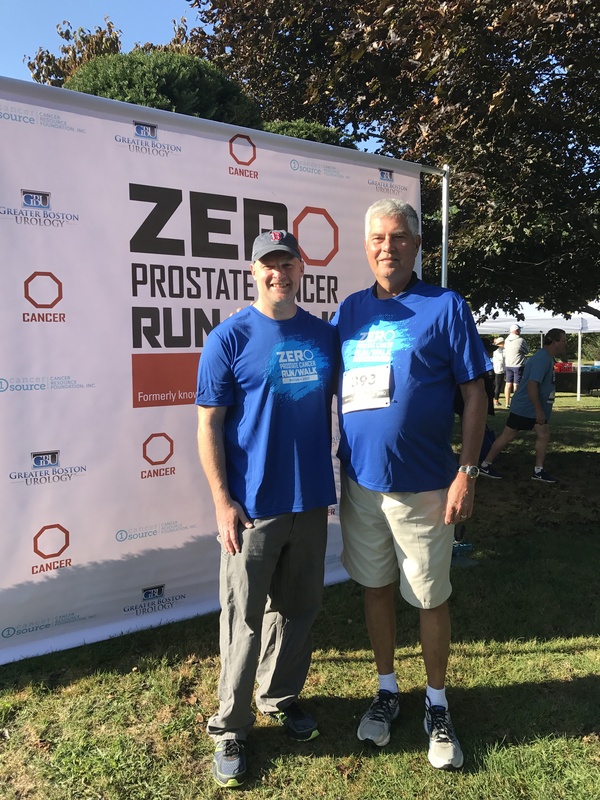 If you know of someone who is dealing with prostate cancer, please give him a link https://zerocancer.org or an email info@zerocancer.org It could save his life. Thanks for sharing your personal story and this important information. I don’t think there’s anyone who hasn’t been impacted by cancer. Donna, it really is something we all can relate to and a cure is so close at hand. Charley and I have been involved for ten years at Johns Hopkins and so many wonderful things have happened. Just the advancements in immunology are incredible. there is lots of hope, too and I don’t want this to be dashed by a group of Senators placing more emphasis on stockpiling weapons for mass destruction as opposed to aiding in a cure for cancer. They are now on the floor of the Senate debating the issue. Claremary, this is an important post that should be read by many people. I don’t think the majority of the country realizes the cost of the drugs and the danger in cuts in funding trials and medical coverage. No, they don’t until they’re in the terrible position of having someone they love refused treatment or not able to get the drugs needed. Affordable/practical health care as a right for everyone should be a top priority in this country. I can’t believe I’m actually stating what should be obvious but it really isn’t. A very personal post from Claremary about trying to find a cure for prostate cancer. I hope it raises awareness of the cost in research and human lives when funding is cut. A very strong and touching story Claremary, the strong bond and love between you and Charley shines through. It is wonderful how these 8 years have put him into remission. I believe the drugs, your love and positive attitude combine t make this huge difference. This is such an uplifting post. I get insane over the cost of drugs. Medicare doesn’t cover all drugs. The last 4 I was prescribed were not covered but fortunately I didn’t need them for anything life saving. I saw recently there is a new treatment for leukemia. Cost is $475,000. The majority of people cannot afford that and my experience has been that although the drug companies say they will “help,” the thresholds are so high that most middle class people don’t qualify. This is an area that needs work in the legislature. Forget about the walls. Make healthcare affordable! Kate- if ever there was a worthy cause, it is getting a reasonable healthcare system for everyone. Hopefully this has now come to the forefront of politics and will stay there until there’s a paradigm shift and everyone understands it’s a right, not a privilege. My proofreading skills want to let you know that Charley is 3 from the RIGHT in the back row of the group photo. 🙂 Loved the story & your dedication to the fight for a cure! Becky, I think I fixed it! Such important funding for these studies! So great to see you both! Lynn, It’s so great to hear from you, too. Whenever I check in on twitter, I always go looking for you. those grand sons are really awesome! Yes, the debate is going on in the Senate right now. I’m very nervous about the whole thing and wish I were up on the Hill to meet with those who would cut funding for 2018. We were able to stop it last year. Charley and I will be in DC once again in February, lobbying . It never ends! It sounds like it! Good job Clare!!! Lynn, Thanks!. I was just on your blog and left a note. Your book is shaping up quite nicely! Great post! Good for Charlie and you. Thanks for the reminder to make sure my husband’s tests are up-to-date. I truly believe it’s wives, daughters, girlfriends who are responsoble for the hundreds of lives saved because we are getting these men to go for check-ups1 Good for you! Claremary, this is such an inspiring and emotional story. Thank you for sharing. Peace. Thanks Claremary. I’m riding the same boat. Hugs. What a wonderful post, Clare. Truly inspiring and it made me weep. I shed tears because I’m happy for Charley and for you and all you’ve been through – but also tears of frustration at how much more could be done for others if only politicians had the will to do so. I had an argument with a friend about a drug for bowel cancer which could give a patient a few more months of life – and real quality life in which he or she could do things. put their affairs in order, take pleasure in still being here. She said the price (about £5,000 per patient) it was too high and the money could be better used elsewhere. She was an accountant with the National Health Service here, which makes me afraid. Ah, the scale that weighs money against human lives. And someday, our accountant may just find herself on that scale. Thank you for posting this Claremary. It is inspiring for us to read as are all success stories of people overcoming and not quitting. You’re welcome.Quitting is never an option with tenacious people. Thank goodness I have something worthy to sink my bulldog teeth into! I hope you are both having fun holding hands and traveling together. So many adventures! Amen to this. We are always holding hands and smiling. Life as you know is precious and we’re learning not to sweat the small stuff. We are only here for a brief moment. Keep fighting the fight and spreading the word. Thanks, Jean. Unfortunately, I just received word that the Durbin-Blunt Amendment was not voted on in the Senate today. A major fight is now ahead for all of us. And it’s all over 0.0023 percent of an incredibly large defence budget! As if the philosophical argument is worth the lives that will be sacrificed while the argument wages. A beautiful post, Clare, and I’m so pleased for you and Charley that you have your life together as a reward for all that you have both gone through. Coming from a country where, by and large, money isn’t a determining factor in medical treatments, I find it inexplicable that the country that likes to see itself as the leader of the developed world doesn’t have a universal healthcare system. Even worse, that the strides that have been made towards that are being taken back by idiots who see everything in terms of making money for themselves and their friends. I hope Charley continues to prosper and you enjoy many more years together, despite the obstacles cretins place in your way. I couldn’t say it better, Clive! You are very welcome, Rosaliene. A very hope-full post and so uplifting Clare. Thanks, Yvette. So much more to accomplish in this political upheaval we are living through. This is a wonderful post, Claremary. Thank you for sharing. Sometimes I have to read a blog article a second time before I can make a reply of any merit. This is one of those. I read this a second time, going slowly to absorb everything you’ve written. You touch on so many significant topics here: the need for Congressional funding for research to find a cure for prostate cancer and all cancers – how can there be any discussion over something so crucial to so many? The funding for organizations like ZERO – again, how do people find money for lottery tickets and lattes, and yet….? The need for funded medical care for everyone NO MATTER WHAT- what else could anyone find more essential? And especially Charley’s contribution to the clinical trials that are essential for finding a cure. Please tell him I said thank you – you and he will save a lot of lives. Hello, Sharon. I know you are living in the caretaker/advocate world right now and hope there is soon a cure for Alzheimer’s. I know there is so much research in that area with much hope for a cure. Let’s make sure the research funding is not cut and the medications are reasonable to give patients and their caregivers the chance for hope and a better quality of life. Please give your mom a special hug for me and I hope your week has hours of peace and joy together. Oh, Clare, the information you share and spread is so important, vitally important. I am so happy for your Charley and pray that research will go on and help so many people. unfortunately, my husband’s dad died some days ago from lung cancer, we could not find appropriate research or anything that would keep him alive, he sadly would never see his grandchildren. So sad, but he was in such a state that we could not bring him abroad or anywhere so far. He lived in Europe. So sad and so difficult. But there is a hope that medicine and science will work fruitfully and soon, very soon, cancer won’t be so scareful and will be successfully cured! You are an amazing woman and real fighter, such people like you change this cruel world! Ann, Sometimes I think that it is just anger and adrenaline that gets me through some days. They are quite powerful motivators. But then there is always love! That is powerful, too. Thank you, my friend. Keep spreading good vibes with your wonderful videos! Ethel, you are an extraordinary woman!! Charley is so blessed to have you! Yes, health care is so expensive. We need to fix that!! The prices of these drugs is absolutely mind-blowing (in a bad way). I do hope that everything works out well for you and for Charlie and every other man who is suffering from prostate cancer. He must have gone through hell – you both must have – but it’s wonderful that he’s taking part in the research. It’s just ridiculous how expensive these drugs are and so sad to know that these big pharmas are comfortable robbing people instead of looking for ways to alleviate the suffering. We lost my dad to Prostate Cancer and believe me when I say that it was a living nightmare. Jacqueline, We’ve advanced so far and could have long ago been at this point if the people with the money and the means put human beings first. It’s too late for our dads but we can still work for a cure for the men in our lives. I am truly sorry you had to experience this tragedy with your father. Thank you, Dennis. We often wonder why we were put here in this place and time and I think this is part of our journey. We are very committed to finding a cure.